Conversion of volume at observed temperature to volume at 15°C for crude oils, generalised petroleum products and lube oils using ASTM Tables 54A, B and D and Generalised Light Products (including LPG) using DIN 51 757 Annex B and Annex G volume correction factors, with the option of rounding the correction factor to four or five decimal places. The calculation of the ASTM VCF incorporates the rounding and truncation routines defined by the ASTM Standard. Correction of density at observed temperature to (standard) density at 15°C for crude oils, generalised petroleum products and lube oils in accordance with ASTM Tables 53A, B and D, with the option for hydrometer correction. The calculation of the standard density incorporates the rounding and truncation routines defined by the ASTM Standard. Intra-conversion of litres, cubic metres, US barrels, US gallons, imperial gallons and cubic feet. Intra-conversion of metric tons, long tons, short tons and pounds. Intra-conversion of kPa, psi, Atm, bar, kgcm-2 and mm hg. Intra-conversion of degrees C and degrees F.
Volume Calculation of standard schedule pipelines ranging from 3/4" to 36", with the option to overwriting standard dimensions if required. Calculation of elapsed decimal hours and hours minutes between commence and completion dates and times. Back calculation of commence date/time or completion date/time from elapsed time is also available. Also reports decimal days. Calculations of pipeline flow rate (kl/hr and metres per second) from either kPa or liquid head (metres) input, and visa versa. The program caters for a pipeline with up to three sections of varying diameter in series and any number of parallel identical pipelines. The hydraulic horsepower is also calculated. The calculations employ the Hagen-Poiseuille, Darcy-Weisbach, Chue and Colebrooke-White equations. Calculation of a limited flow rate to avoid the risk of damaging pressure surge against inadvertent rapid valve closure (such as during topping off aboard ship etc), in accordance with the formular provided in the ISGOTT manual. Calculation of the head pressure arising from a liquid column e.g. 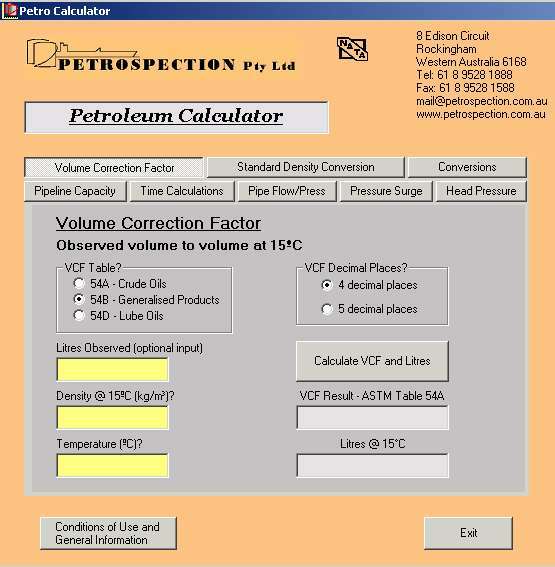 liquid height in a storage tank and within an inclined pipeline etc. This program is a free tool. Feedback and suggestions are most welcome. If you are running an older version of Windows, you may require WinZip to open.zip files. A free shareware version is avaliable here. If you are upgrading to a later version of the PetroCalculator in the Windows setup configuration , remove the previous version first. If you have problems installing Petrocalculator in the Windows setup configuration , you can alternately download the "executable file only" version and place it into it's own directory on the root directory. You can then run PetroCalculator from that directory. If you are upgrading the "executable file only configuration", simply overwrite the old executable file with the new file.